Having just finished “One Hundred Years of Menswear” (Cally Blackman) and just started “American Fashion Menswear” with superb commentary by this man, I’ve been revisiting my sartorial past when most of my aesthetic centered on the drape cut of the 1930’s. I didn’t own anything from the 1930’s, I just liked the way it looked in the illustrations and on the silver screen. Not long ago, that look could be duplicated. BGO sold it when I was first a customer, then an employee (when it was filtered through the Italian labels). Ralph Lauren continues to reinterpret it. Alan Flusser champions the look and there are those lucky enough to bespeak it from the hallowed halls of Anderson & Sheppard and the like. Today, however, it is hard to find an off-the-peg suit that is cut like that. Today’s look is lean, perhaps in reflection of our leaner times. Perhaps celebrating the athletic bodies of today’s young people. Perhaps the designers just needed to shift the fashions to something different. The beauty of the British Blade or London Cut, or Drape Suit is that it is based, like a lot of successful menswear, on military lines. Scholte invented the cut after seeing how the Life Guards’ uniforms made the men look more athletic — pigeon breasted with nipped waists and strong shoulders. Thanks to the extra material over the shoulder blades and through the chest, the cut was extremely soft and comfortable to wear. If you’re looking for that kind of a suit, your best bet these days is eBay, or a thrift shop or a vintage boutique. 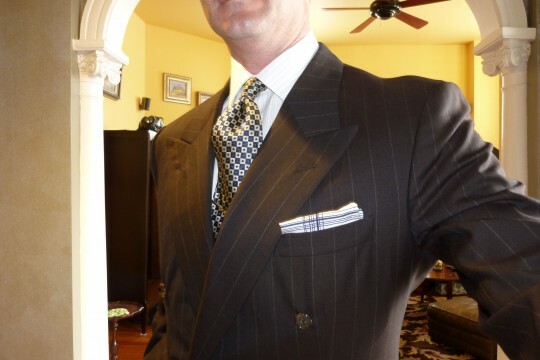 The custom tailored Dunhill brown chalk stripe DB came from an eBay seller. It was made in ’98 for a stockbroker in NYC (isn’t google scary?) The tie is vintage Britches. The antique stripe shirt is Tommy Bahama via TJ Maxx and the tie bar from I don’t know where. R. Martegani custom monkstraps in an orangey-brown finish the look. Yes, I like the reimagined late 50’s/early 60’s Mad Men/North by Northwest inspired suits so prevalent today. But in a drape suit, I feel lighter, happier and less hard edged. In a sea of the trendy, you will bob about like an elegant buoy. Not brand new and shiny, but something to cling to when the latest crazes sink beneath the waves of fashion. There’s a lot to be said for the escapism of the Depression era. This entry was posted in Elegantology and tagged "American Fashion Menswear", "One Hundred Years of Menswear", 1930's, Alan Flusser, Anderson & Sheppard, BGO, British Blade, Drape silhouette, Drape Suit, Life Guards, London Cut, Mad Men, North By Northwest, R. Martegani, Ralph Lauren, Robert E. Bryan, Scholte. Bookmark the permalink. So elegant in the fabric, the cut and of coarse the fit on the man wearing it!! You are elegant, Mr. E. I like the mixing of patterns, striped jacket, patterned tie and hankerchief (is it plaid?). Thank you b, The shirt is an antique cream, white, brown and blue stripe and the pocket square is a silk/cotton blue patterned number. If you double click the image you can get really close up. Way to go Mr E! Despite the current popularity of retro Sixties looks due the ‘Madmen’ phenom, the Thirties is the Golden Age of Menswear………..and maybe(?) the Edwardians.